"There's a guy out there that says he's the best fighter in the world and he couldn't knock this guy out, and I think it'll be great for us to do that," stated five-time Trainer of the Year Freddie Roach, who discussed his plans for Manny Pacquiao's upcoming title defense against "Sugar" Shane Mosley. Roach made it clear that one of their goals is to put on a much more dominant performance than Mayweather, who won a lopsided 12-round unanimous decision against an uncompetitive Mosley, and in order to that, he fully expects Pacquiao to be the first person to stop the future Hall of Famer. "He'll be the first person to stop Mosley. 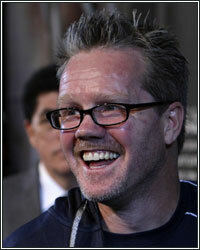 It'll really be the icing on the cake," Roach explained during a recent press conference to promote the bout. "That's my goal, yes, I mean, because we're a better fighter than him and we showed every time. Any fights that we've had similar opponents, we've dominated the opponents that he hasn't and we've proven that we're better than him and it will be just another day that maybe we get him to sign that contract." Whether or not Pacquiao can put a dent into the seemingly unbreakable chin of Mosley remains to be seen, however, it appears that Roach has already seen something that he thinks they will be able to take advantage of. Thus far, Pacquiao has indeed outperformaned Mayweather against common opponents Oscar De La Hoya and Ricky Hatton, dominating and stopping both fighters much easier than Mayweather, who fought them before the Filipino superstar. Will this be another fight where Pacquiao's performance proves him to be the superior pound-for-pound fighter over Floyd, or will Shane Mosley have more success this May than he did last May? Let us know your thoughts in the comments below.